t-RFA is an effective treatment for metastatic spinal tumors, and you already know how to perform it. Patients with metastatic spinal tumors, with or without visible compression of a pathologic fracture, are often in considerable pain. Radiation therapy, the traditional treatment choice for metastatic bone pain, can lead to incomplete relief because it treats only the pain related to the tumor, but not the mechanical pain caused by the related macroscopic and/or microscopic pathologic fractures. As an interventional radiologist, I rely on targeted radiofrequency ablation (t-RFA), which provides nearly immediate pain relief and, in some instances, localized tumor control. When indicated, I couple t-RFA with vertebral augmentation. The response is dramatic and consistent; many of our patients have shed tears of relief after suffering in pain for months. Seeing such marked pain relief and emotional relief in cancer patients makes t-RFA a very compelling procedure. t-RFA is one of the easiest procedures I have ever learned. It marries two procedures I already perform frequently: tumor ablation and vertebral augmentation. Use of the device is straightforward, and there was very little extra to learn. Any of my colleagues in IR could do a beautiful job with their very first patient—all the more reason to get started. Radiation is thought of as the traditional therapy for painful metastatic lesions. However, many medical oncologists and radiation oncologists are beginning to rethink that choice in cases where metastatic spinal tumors are combined with one or more pathologic fractures. They are realizing that when there are both tumors and associated pathologic fractures, radiation alone may not have significant effects on the fracture-related, mechanical-based pain. In fact, around one-third of the time, depending on the type of radiation treatment employed, radiation can cause a secondary fracture, even as it controls the tumor. Patients who are treated with radiation therapy often require yet another referral to the interventional radiologist for vertebral augmentation to treat the fracture-related pain. Early in my practice, virtually every patient referred for RFA had a compression fracture and associated metastatic lesion. Recently, however, I have begun to see patients with painful metastases of a vertebra containing a lytic lesion but no visible compression of the vertebra. According to the referring oncologists, they are witnessing such immediate and lasting pain relief that they do not see the need for an immediate referral to radiation oncology, especially for those patients preferring to avoid or delay radiation therapy. I have had a few colleagues say to me, "Why not make a single referral to IR and have both tumor pain and fracture-related pain treated simultaneously? "—and with nearly immediate relief. Another important point is that RFA is a nonionizing therapy, so patients can have t-RFA prior to, after, or concurrently with radiation, chemotherapy, or any other treatment that physicians do not want to interrupt. t-RFA is also an option for patients who have met their radiation dose tolerance or who have radioresistant tumors or persistent pain after radiation therapy. In addition, both stereotactic body radiation therapy and the traditional 30 Gy in 10 fractions take considerably longer time to relieve pain and are considerably more costly than t-RFA. Recovery from the procedure is so quick that patients have undergone the procedure on their way to an office visit with their medical or radiation oncologist. Using the STAR Tumor Ablation System from Merit Medical, t-RFA typically takes about an hour with the patient under conscious sedation. Unilateral, single-pedicle needle cannula access is established using fluoroscopy alone or, if desired, with CT guidance. Bringing a C-arm into the CT room is also simple to do. Targeted cavities are created using the navigational PowerCURVE Osteotome. The SpineSTAR RFA device is then inserted through the cannula and articulated to the desired targets, and the ablation is performed. Each ablation zone requires between five and 10 minutes, depending on the size of the desired ablation. The SpineSTAR is removed and cement with a very long working time is then delivered through the cannula into the vertebral body, when indicated. The cement is heated as it passes through the delivery system, causing it to become highly viscous, very controllable, and much less likely to extravasate. The single cannula is removed, and a small bandage is applied. The patient is discharged an hour later. Dramatic pain relief is virtually instantaneous. When patients come in, they often have severe pain scores of 8, 9, or 10 out of 10. Typically, immediately after the procedure, their pain scores drop to 3, 4, or 5. The scores will often go on to improve over the next few days to 2 or 3. The relief is durable and results in significant improvement to patients' quality of life. Patients are often stunned by how soon they feel better. Multiple times, I have had patients and families refer to the entire experience as "a simple injection." That's what they see. Grammie goes into the IR suite, emerges one hour later with a Band-Aid on her back, and she's essentially pain-free. In fact, some patients and families have actually become angry because they were made to wait so long for help, suffering for weeks or months before they either came upon a doctor who referred them for this treatment or learned of it online. Not enough of my colleagues are doing t-RFA for metastatic spinal tumors right now, but I am hopeful that this will change. Pain management for the cancer patient is paramount. The principles and goals of this treatment are right there, spelled out in the National Comprehensive Cancer Network Cancer Guidelines for Adult Cancer Pain. It fits perfectly into the group of procedures that we already offer for the cancer patient, such as celiac ganglion blocks and vertebral augmentation. Not only do we, as interventional radiologists, already have the skills to perform the procedure well, such as our understanding of cross-sectional imaging and our image-guided needle skills, but many of us also have similar referral models already in place. Even if you are not performing complicated yttrium-90 radioembolizations, transarterial chemoembolization, or tumor ablations, but you do place ports, perform drainages or biopsies, perform basic pain procedures, and can get to tumor boards, you can easily transition your practice into this area and make a real difference in many patients' lives. Think about all the patients who view this as "a simple injection"—not much different from the pain blocks we routinely perform for cancer patients. And like pain blocks, t-RFA is another tool we can use to treat people quickly and afford them tremendous relief. It's exciting to think that this procedure could someday fit similarly into the routine armamentarium for helping people with cancer-related pain. If you want to offer t-RFA, talk to your medical oncology community about their pain and palliative team. Ask them how they currently manage their patients with painful metastatic spinal tumors, and educate them about this procedure. 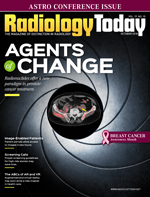 Talk to the radiation oncology community, and offer t-RFA as a synergistic procedure, not as something disruptive. Take the time to speak at tumor boards. Help your colleagues see you as an interventional oncologist, committed to the whole breadth of cancer care. Most importantly, stress the significance of the outcomes. — James G. Carlisle, MD, is an interventional radiologist with Utah Imaging Associates and Mountainstar Health System based in Salt Lake City. His primary areas of focus are interventional oncology and clinical trials. He is a paid consultant of Merit Medical.